Cheri and I have been having a fantastic summer show season so far! All Fall, Winter and Spring I work away in the studio creating the artwork that will be showcased in the summer shows. These are long solitude filled days full of anticipation for the opportunities to share the work with clientele during the shows, and the payoff is always worth the effort. For this Summer, the 3 larger shows that we focused on were the Circle Craft Summer Show, the Filberg Festival in Comox, and the last weekend of the West Vancouver Harmony Arts Festival. These 3 shows ran consecutively week after week which left Cheri and I in a frantic pace with a lot of long days trying to keep up! 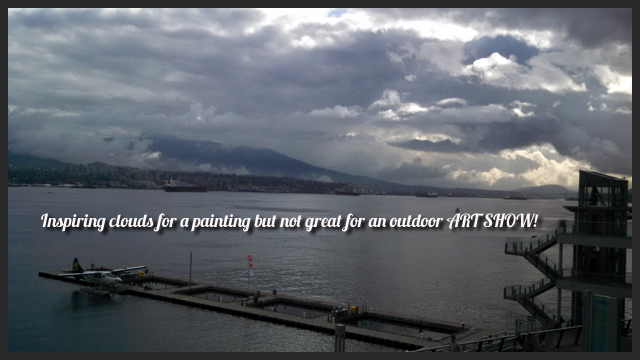 Circle Craft Summer show at Jack Poole Plaza in Vancouver, was our second year of participating. The event is excellently run and the turn out of tourists and locals is a very conducive mix for pairing artwork with collectors. This year was a little slower in attendance due to the rain and cold weather. A rather freakish turn considering the incredible dry and warm weather we have experienced this Summer! The bad weather never seems to keep the true enthusiasts at bay though, and the rainiest of days saw our largest sales. We had the incredible pleasure of meeting a wonderful couple from Northern BC who took home 3 of the larger original paintings, and I couldn’t be happier that these particular paintings have stayed together. Some of the originals found homes with tourists and we just shipped one off to Florida. The 4 days of Circle Craft, although long and hard on the feet, are always an intense pleasure in the opportunity to showcase the work and tell our story to so many truly kind and generous people. 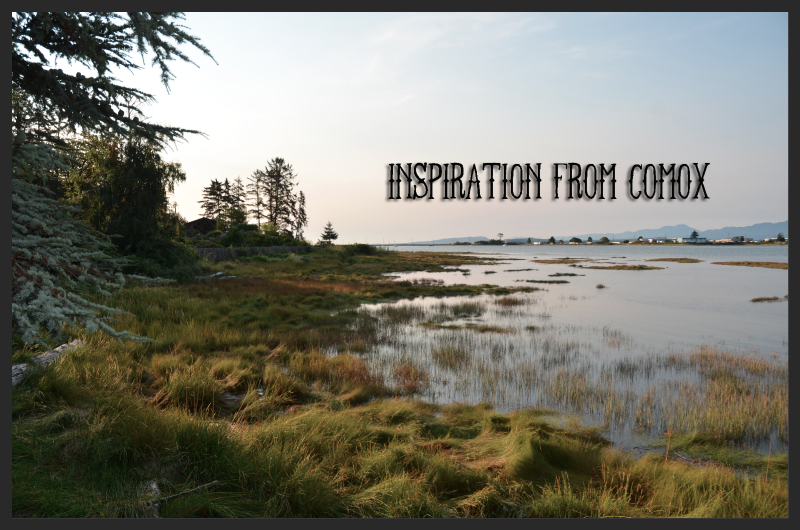 After Circle Craft, we were home for a day and then off to Comox on Vancouver Island for the Filberg Festival. This was our first year in attending this show. We were extra busy in our preparation as we were going to be spending the entire week living out of our Mobile Studio Galley nicknamed Maggie. She found her name by the acronym for Mobile Art Gallery. As this was our first real trip, and by far the furthest distance we had driven her, we were nervously excited to get underway. At this point in time we had only had her on the freeway once and it was a white knuckled experience! The front end was seriously out of alignment but thankfully we found a great shop in Port Kells that was able to get her fixed up the day before we left. Unfortunately things were still not right, partly due to the wrong tires having been installed, and any speed over 80km/h was avoided like the plague. So it took us a little longer to get there than we had planned, but it was worth it. 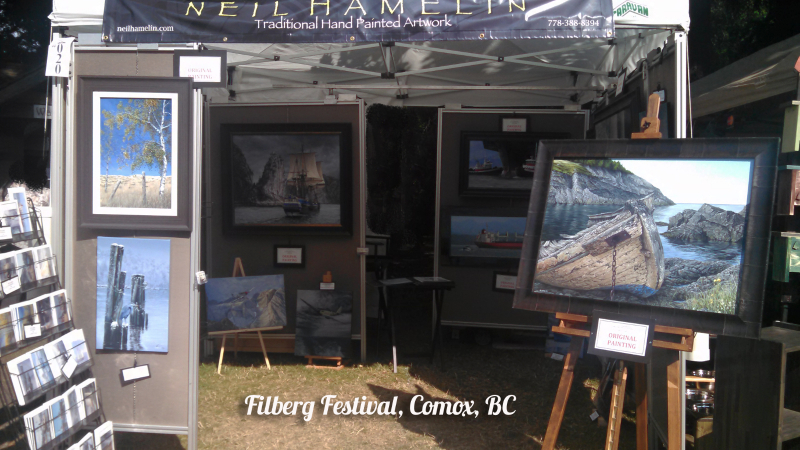 The Filberg Festival is housed on one of the nicest grounds we have had the pleasure of participating at a show on. The park is wooded in areas with a great old weathered lodge and many old outbuildings, and as it is right on the ocean, the views and ocean breeze were a constant companion! The show was well attended and the sales were great, but above all else, the enjoyment found in the time spent in such an incredible location around so many fantastic people was the true treasure we took home. One of the memorable experiences of this show happened after the show was officially over. After day four, followed up by a long takedown of our display, Cheri and I had decided to retreat back to our campground for one more evening of relaxation before heading to the Ferry the next day. We were glad we did as it gave us the fortuitous opportunity to meet a lovely couple from Victoria who had attended the show, and were still interested in one of the originals we had displayed. We invited them back to the campground later for a visit and the chance to see the painting one more time. Thankfully we were able to display the work on the walls of Maggie, the way she was intended, and she helped facilitate the sale! The true joy of this encounter was the opportunity to spend a short evening visiting with a fantastic couple who live an amazing family enriched lifestyle. We raced back home and had no time to spare before setting up for the last weekend of the Harmony Arts Festival. That Festival is a favourite of ours as we see so many of the same clients every year and its another great location to meet tourists enjoying our amazing city. The last weekend is only 3 days versus the 4 days of the first weekend, and truthfully we would of enjoyed spending even more time at this event. Our booth looked over English Bay and Stanley Park, and as the evenings fell the entertainment ramped up. There are two stages at the event and the area gets very busy in the evening! It always take a little time to recover from these shows. I am now back home in the studio staring at another painting underway on the easel and it will be a few more days before my energy returns. Every artist that takes part in shows like these will attest to the fact that there is a very intense emotional drain that takes place. I put all of myself in every painting and can’t help but be fully engaged when sharing the work with others. I create all year daydreaming of the opportunity to show the work in person and when the time finally comes around, it may be a whirlwind of activity but the payoff is found in the generosity of those that appreciate the artwork! Cheri and I consider ourselves very fortunate to meet and speak to all of you at these shows. Our network of true friends grow with every show!